What a weekend! The Welsh trip can be considered by those who were there, and by the comments received from the audiences and other choir members, to have been a great success. In short, this is what it contained; One hundred and ten choir members, family and friends, two coaches, and ten cars. There were three concerts in three different venues, and we sang with two Welsh choirs. 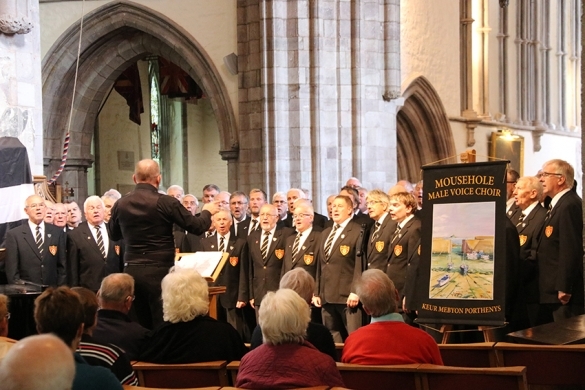 Mousehole MVC sang twenty-one different pieces of music, and over one thousand people listened to the concerts. There was also the odd pint of orange juice drunk! After travelling on Thursday 6th September, the choir began its tour on Friday with a lunchtime recital in Brecon Cathedral, with all the proceeds going to help with the restoration of the cathedral roof. The concert marked the end of the cathedral’s lunchtime recitals for the year and was packed by locals and holidaymakers alike. This was one of the most beautiful cathedrals the choir has sung in and we were pleased to be asked to provide an encore which, fittingly, was “We Rise Again”. 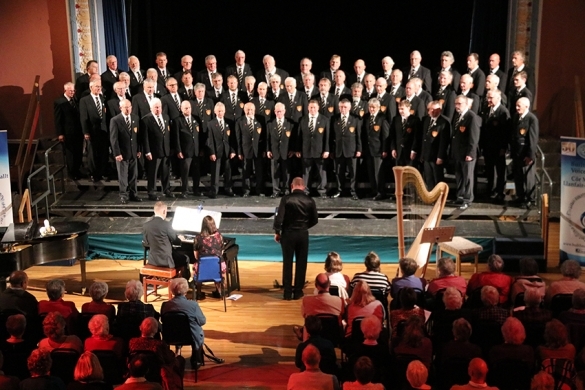 Following some free time, in Abergavenny, the choir held the second of their concerts with Blaenavon Male Voice Choir in the King Henry VIII School. Again the choir sang to a packed house, met with some old friends including a lady emanating from Bugle but now living in Wales and then proceeded into town for an afterglow with the hosting choir. The choir returned to the hotel thirteen hours after setting out! 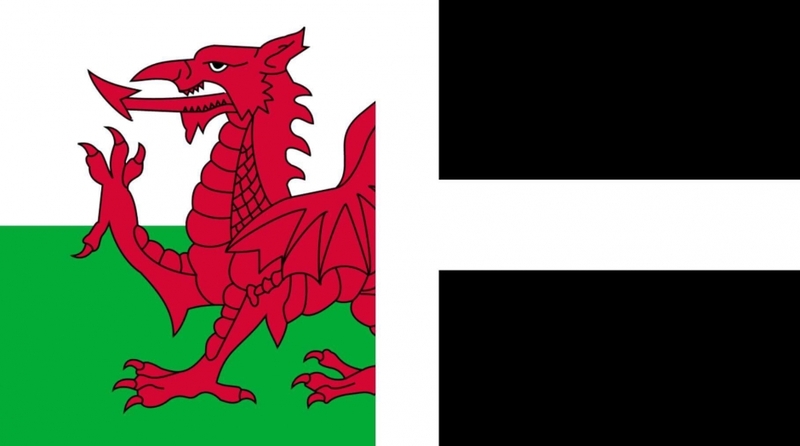 With a free day on Saturday, members of the choir travelled to the Elan Valley in the coaches, whilst other members stayed in Llandrindod Wells and some going farther afield to Powis Castle. 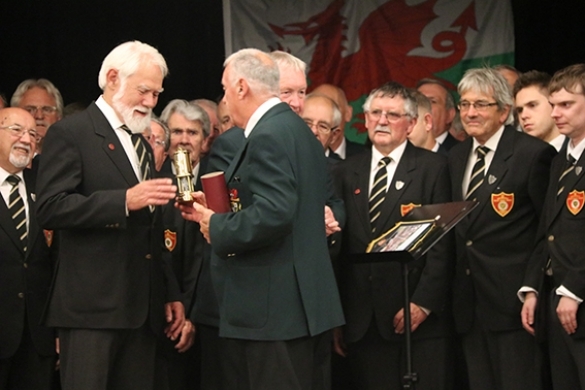 The free time, where ever spent, was put to good use in preparing for the concert highlight of the tour, the gala concert with Builth Male Voice Choir in the Pavilion Mid Wales, Llandrindod Wells. The Grand Pavilion opened in 1912 and was a wonderful environment in which to sing. 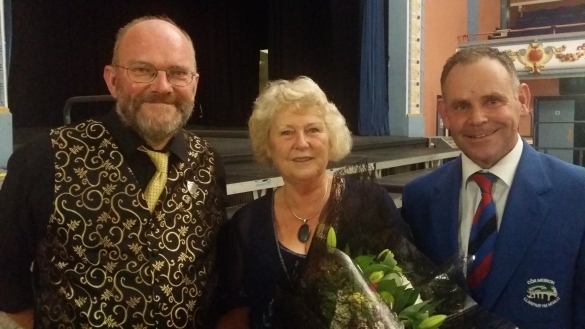 This festival of music celebrated the fiftieth anniversary of the founding of Builth MVC. 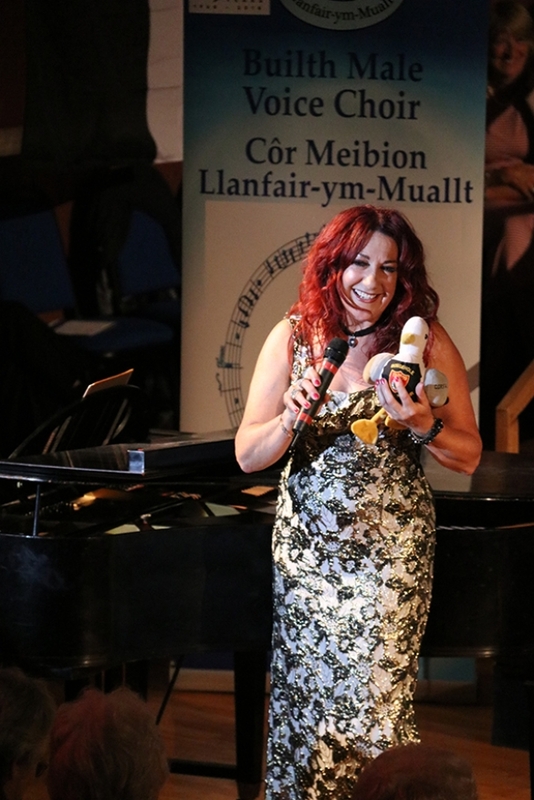 Appearing with the choirs was Welsh personality, Shân Cothi who is a versatile performer in both classical and musical theatre repertoire and Martha Powell, a very talented young musician playing the harp. The two choirs came together at the end and performed a choir favourite, Stephen Smith’s arrangement of “We Rise Again” and, with Shân Cothi, Alwyn Humphreys arrangement of Hammerstein and Rodgers “You’ll Never Walk Alone”. The evening’s singing concluded with a standing ovation from the audience of four hundred and thirty. Words like “Amazing”, “Wonderful” and “Excellent”, together with “A Feast of Singing” were used to describe the concert and together with the laughter it was a magical evening. Afterward, the choir remained in the theatre where Builth MVC provided a wonderful buffet as part of the afterglow. New friends were made and the singing continued well into the early hours of the morning. 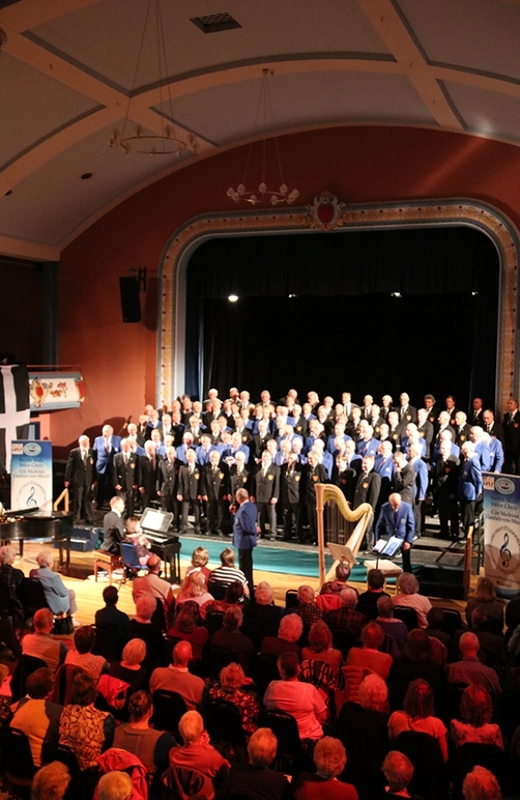 We would like to thank all those who made our stay so successful, not only from the hotel where we stayed but to both choirs in extending an invitation to us, especially Builth MVC who considered Mousehole MVC as special guests. This tour has provided those who went with some very special memories, much laughter new friends and much camaraderie.